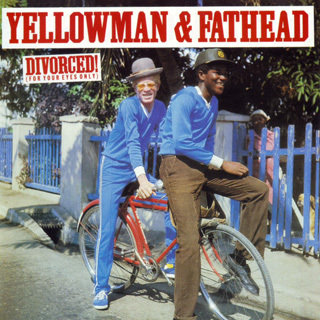 Then Yellowman why did you divorced Susan? Boy Fathead I can't take it no longer. I just can't take it no longer. Seen? I'm getting divorced in the evening. Buff-baff Susan get a lot of beating. Why? so take me to the family court on time! Me dress up ina jacket, me dress up ina tie. As me reaching court the girl a tell lie. The judge seh: I know you never loved that gal. Then tell me your honour why she married I and I? Put her in the kitchen to fry some chicken. Put her in the kitchen to boil some rice. When me see what she do me bawl Jesus Christ! She burned-out the chicken and ??? the rice! Buff-baff Susan get a lot of beating. Me one Susan she have plenty man. She have 3 a them wey live a Portland. and one a them a soldier ina Hope Park camp. Me pack up me thing and go thru the door. Me wave my hand and seh: Good bye Susan! Why I! And me will satisfy! Buff-baff Susan get a lot of beating. Tell me why? as night come she gone let the yellow baby! Me love Susan 'til me go a obeah-man. The obeah-man seh: I beg you stretch out you hand. Me stretch out mi hand and then he read my palm. He open the Bible and read one psalm. Him seh: Yellowman I gwaan tell you wey they gwaan. Fathead and fi you woman them just gone! Me no want! Me no want! Where Fathead ya man left!